The Back To Back Standing Desk is designed for large office environments in mind. 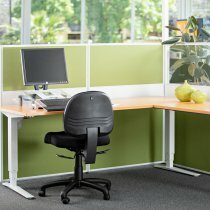 Create two workstations with the ability to separate the desks from each other with a partition screen. 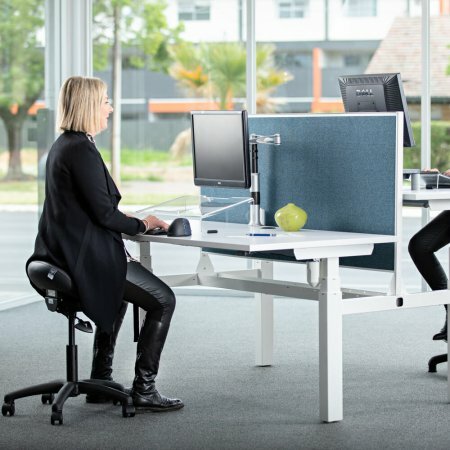 Small and tall people will be able to use the same desk with a motorised adjustable height. The Back To Back Standing desk is suitable for large office environments and the design makes it easy to separate the desks from each other with a partition screen. Size, shape & colour combinations to suit your office decor. Allows workstations to be easily shared; personalised settings in just seconds. Desk solution for short and tall people. Trying to find a perfect desk that is right for you? Confused with all the options? Back Centre Desk Selector will guide you through a series of questions to help determine the desk that is just right for you! 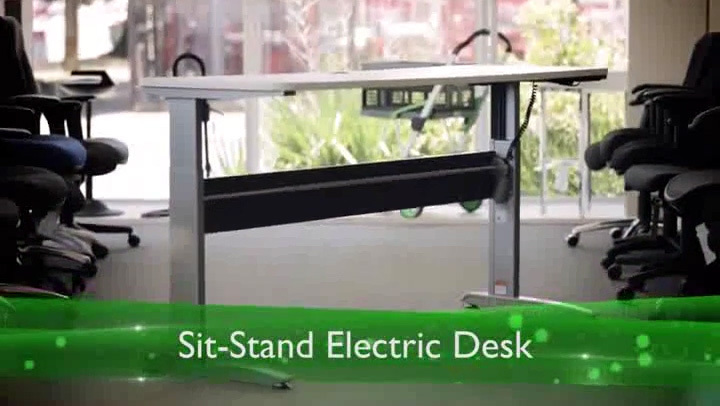 A height adjustable standing desk enables the desk to be adjusted to suit the individual. It makes it possible to place a screen, keyboard, and mouse at the appropriate height. Without enough depth, you will struggle to keep the monitor and the keyboard at an optimum distance. Additional depth may be required for documents. We suggest a document holder which can be positioned between the keyboard and the monitor. The standing workstations needs to be wide enough to have adequate area for all types of work. Including typing, reading, writing and a coffee of course! Underneath the desk, the construction should leave space for the legs to be moved freely. Why should you use a Standing Desk? Are you getting back pain at your desk? Want a more active workspace? By using a standing workstation, results have shown a significant decrease in the severity of musculoskeletal discomfort. By regularly changing positions throughout your work day it can help prevent back problems and prevent stooping. By using an electric height adjustable standing desk, work styles can be adjusted to suit the individual and increase productivity. 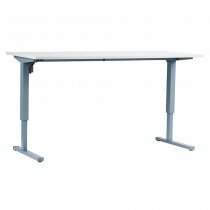 An electric height adjustable desk is beneficial where workstations are shared, ensuring that every worker can have a suitable height desk. Employers investing in an electric sit-stand desk are realising the great advantages. Employees are happier, healthier and even more productive. This translates into cost saving and an improved working environment. Contact us today to book in an Ergonomic Assessment to improve your posture and work environment. Watch the video below to get a better understanding of why an adjustable standing desk is a perfect investment for you and your employees.